Historically, illegal drugs were being used to destroy sovereign countries, and by now the Philippines’ war on drugs is a regular headline by CIA funded journalists and media networks, and a constant object for criticism of the Soros’ Open Society Foundation funded pseudo-non-government organizations, for being brutal and violative of human rights. Those same critics, however, failed to put their money where their mouth is, especially when it comes to helping the Duterte government rehabilitate close to a million drug surrendered. They would rather focus our attention into the 3,700 deaths, some of which are the direct result of the decisive police action, and the rest were victims of the drug syndicates who are now cleaning their own ranks from squealers, i.e. those who have surrendered and subsequently named their suppliers. The same bleeding hearts who chose to ignore the fact that the statistics related to crime are just the same as in past administrations, only this time it is the criminals who are dying, because once a poor brat is hooked into meth, he must do whatever he can get his fix for the day, which include cell phone snatching, daylight robbery, etc. Other sordid crimes relating to meth addiction were also brought to light including cannibalism, and in the realm of politics, it has sent a former justice secretary to the present senate, on top of congressmen and mayors who are already funded with drug money for years. 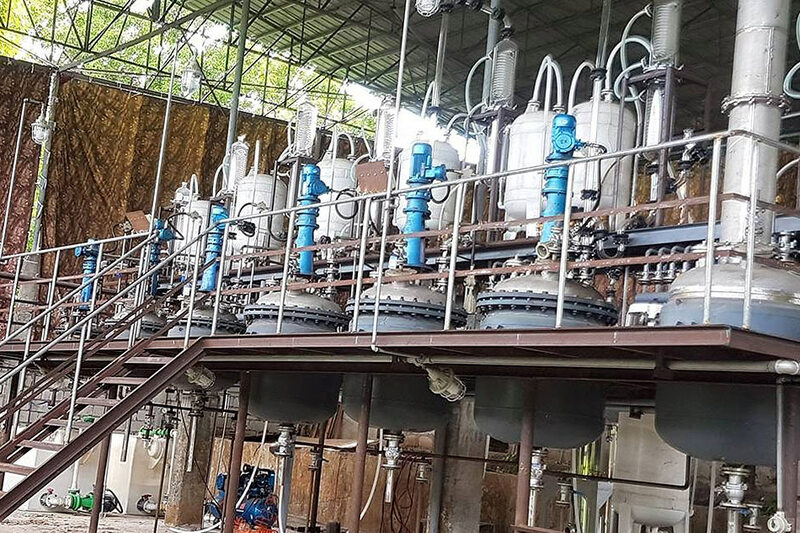 Recently discovered and shutdown by the Duterte government, the industrial size meth lab shown above is capable of producing 800-1000 kgs per day, or Php 1 billion a day income for the druglords. In short, the Philippines’ war on drugs is a necessary measure that must be taken before the country plunges completely into another failed state via narcopolitics. Still at 100th day in office, the Duterte government is able to reduce the crime rate to 50% nationwide using only the national budget crafted by his predecessor. 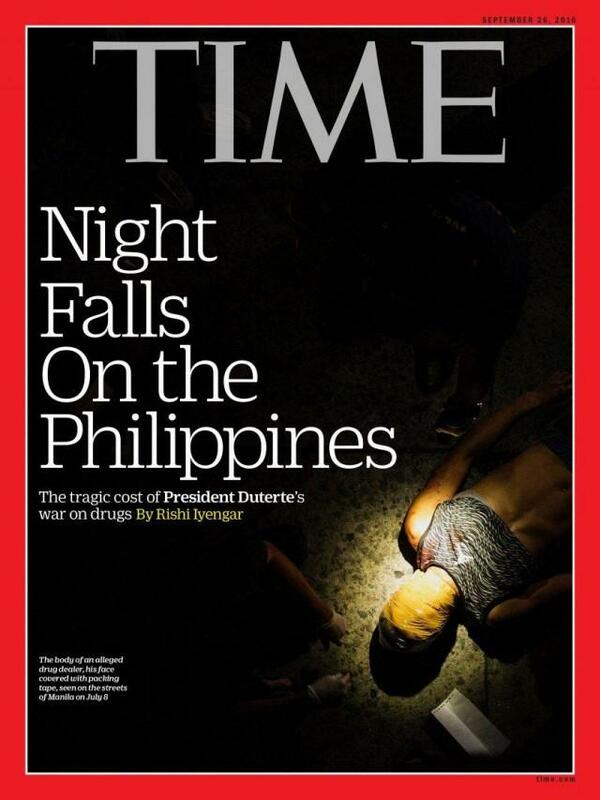 The same budget, which does not include the establishment of rehabilitation centers necessary to help the projected 4 million drug dependents, and for whom the US, EU and UN “human rights advocates” could help more than just paying lip service to the 3,750 so called victims of extrajudicial killings. These hypocrites should know that China has already provided , without so much fanfare, the funding for the construction of one drug rehabilitation center to house at least 1,500 drug addicts, for a start. 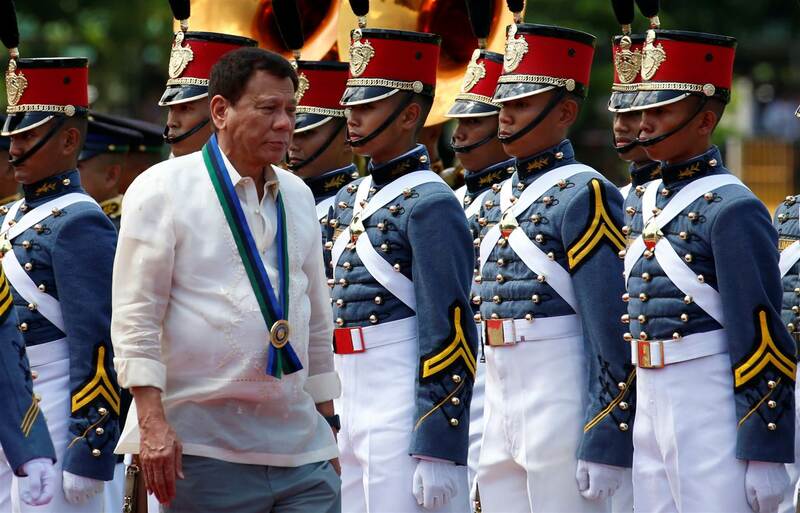 There will be more productive cooperation between the Philippines and China as Duterte is scheduled to start pivoting towards the BRICS within this month, in a bid to end the unacknowledged abuses of the US government since 1896. The Bud Dajo Massacre. 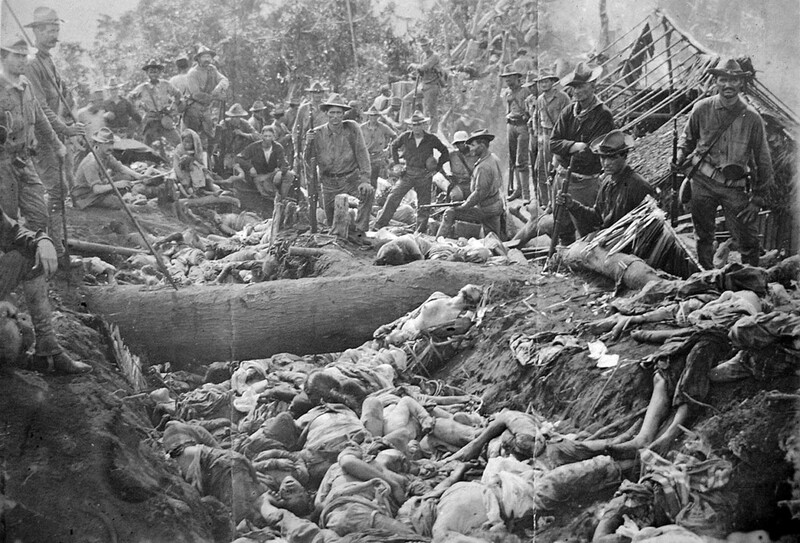 The bodies of Moro insurgents and civilians killed by US troops during the Battle of Bud Dajo in the Philippines, March 7, 1906. To all those who would rather criticize the sensible actions of the Philippine government that is enjoying 97% trust rating, are you really raising concerns over potential human rights violations, or just in it to protect the illegal drug industry? This article was first published on August 31, 2008. According to Alfred W. McCoy in The Politics of Heroin in Southeast Asia, CIA arms, money, and disinformation enabled Corsican criminal syndicates in Marseille to wrestle control of labor unions from the Communist Party. The Corsicans gained political influence and control over the docks — ideal conditions for cementing a long-term partnership with mafia drug distributors, which turned Marseille into the postwar heroin capital of the Western world. Marseille’s first heroin laboratones were opened in 1951, only months after the Corsicans took over the waterfront. 1950s to early 1970s, INDOCHINA During U.S. military involvement in Laos and other parts of Indochina, Air America flew opium and heroin throughout the area. Many Gl’s in Vietnam became addicts. A laboratory built at CIA headquarters in northern Laos was used to refine heroin. After a decade of American military intervention, Southeast Asia had become the source of 70 percent of the world’s illicit opium and the major supplier of raw materials for America’s booming heroin market. In Costa Rica, which served as the “Southern Front” for the contras (Honduras being the Northern Front), there were several different ClA-contra networks involved in drug trafficking. In addition to those servicing the Meneses-Blandon operation detailed by the Mercury News, and Noriega’s operation, there was CIA operative John Hull, whose farms along Costa Rica’s border with Nicaragua were the main staging area for the contras. Hull and other ClA-connected contra supporters and pilots teamed up with George Morales, a major Miami-based Colombian drug trafficker who later admitted to giving $3 million in cash and several planes to contra leaders. In 1989, after the Costa Rica government indicted Hull for drug trafficking, a DEA-hired plane clandestinely and illegally flew the CIA operative to Miami, via Haiti. The US repeatedly thwarted Costa Rican efforts to extradite Hull back to Costa Rica to stand trial. Another Costa Rican-based drug ring involved a group of Cuban Amencans whom the CIA had hired as military trainers for the contras. 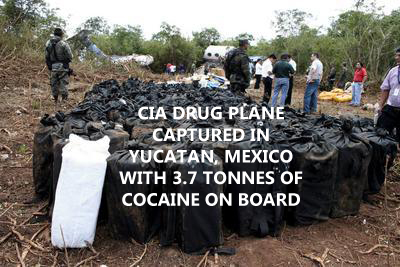 Many had long been involved with the CIA and drug trafficking They used contra planes and a Costa Rican-based shnmp company, which laundered money for the CIA, to move cocaine to the U.S. Costa Rica was not the only route. Guatemala, whose military intelligence service — closely associated with the CIA — harbored many drug traffickers, according to the DEA, was another way station along the cocaine highway. Additionally, the Medellin Cartel’s Miami accountant, Ramon Milian Rodriguez, testified that he funneled nearly $10 million to Nicaraguan contras through long-time CIA operative Felix Rodriguez, who was based at Ilopango Air Force Base in El Salvador. The contras provided both protection and infrastructure (planes, pilots, airstrips, warehouses, front companies and banks) to these ClA-linked drug networks. At least four transport companies under investigation for drug trafficking received US govemment contracts to carry non-lethal supplies to the contras. Southern Air Transport, “formerly” ClA-owned, and later under Pentagon contract, was involved in the drug running as well. Cocaine-laden planes flew to Florida, Texas, Louisiana and other locations, including several militarv bases Designated as ‘Contra Craft,” these shipments were not to be inspected. When some authority wasn’t clued in and made an arrest, powerful strings were pulled on behalf of dropping the case, acquittal, reduced sentence, or deportation. ClA-supported Moujahedeen rebels engaged heavily in drug trafficking while fighting against the Soviet-supported govemment and its plans to reform the very backward Afghan society. The Agency’s principal client was Gulbuddin Hekmatyar, one of the leading druglords and leading heroin refiner. CIA supplied trucks and mules, which had carried arms into Afghanistan, were used to transport opium to laboratories along the Afghan Pakistan border. The output provided up to one half of the heroin used annually in the United States and three-quarters of that used in Western Europe. US officials admitted in 1990 that they had failed to investigate or take action against the drug operabon because of a desire not to offend their Pakistani and Afghan allies. In 1993, an official of the DEA called Afghanistan the new Colombia of the drug world. While working to keep key Haitian military and political leaders in power, the CIA turned a blind eye to their clients’ drug trafficking. In 1986, the Agency added some more names to its payroll by creating a new Haitian organization, the National Intelligence Service (SIN). SIN was purportedly created to fight the cocaine trade, though SIN officers themselves engaged in the trafficking, a trade aided and abetted by some of the Haitian military and political leaders. 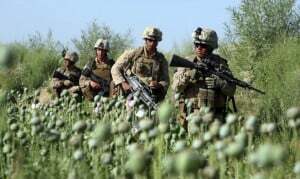 In 2014 the Afghan opium cultivation has once again hit a record high, according to the United Nations Office on Drugs and Crime’s 2014 Afghan Opium Survey. In the course of the last four years, there has been a surge in Afghan opium production. The Vienna based UN Office on Drugs and Crime (UNODC) reveals that poppy cultivation in 2012 extended over an area of more than 154,000 hectares, an increase of 18% over 2011. A UNODC spokesperson confirmed in 2013 that opium production is heading towards record levels. Source: United Nations Office on Drugs and Crime’s 2014 Afghan Opium Survey. According to the 2012 Afghanistan Opium Survey released in November 2012 by the Ministry of Counter Narcotics (MCN) and the United Nations Office on Drugs and Crime (UNODC). potential opium production in 2012 was of the order of 3,700 tons, a decline of 18 percent in relation to 2001, according to UNODC data. There is reason to believe that this figure of 3700 tons is grossly underestimated. Moreover, it contradicts the UNOCD’s own predictions of record harvests over an extended area of cultivation. While bad weather and damaged crops may have played a role as suggested by the UNODC, based on historical trends, the potential production for an area of cultivation of 154,000 hectares, should be well in excess of 6000 tons. With 80,000 hectares in cultivation in 2003, production was already of the order of 3600 tons. It is worth noting that UNODC has modified the concepts and figures on opium sales and heroin production, as outlined by the European Monitoring Centre for Drugs and Drug Addiction (EMCDDA). There is no evidence that a large percentage of opium production is no longer processed into heroin as claimed by the UN. This revised UNODC methodology has served, –through the outright manipulation of statistical concepts– to artificially reduce the size of of the global trade in heroin. “an estimated 3 400 tonnes of Afghan opium was not transformed into heroin or morphine in 2011. 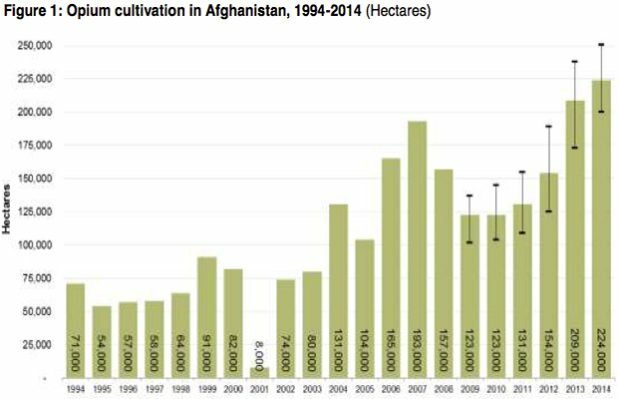 Compared with previous years, this is an exceptionally high proportion of the total crop, representing nearly 60 % of the Afghan opium harvest and close to 50 % of the global harvest in 2011. What the UNODC, –whose mandate is to support the prevention of organized criminal activity– has done is to obfuscate the size and criminal nature of the Afghan drug trade, intimating –without evidence– that a large part of the opium is no longer channeled towards the illegal heroin market. In 2012 according to the UNODC, farmgate prices for opium were of the order of 196 per kg. 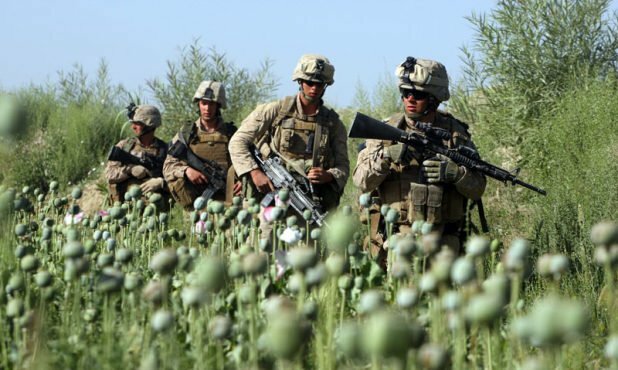 According to the United Nations Office on Drugs and Crime (UNODC), opium production in Afghanistan in 2003 is estimated at 3,600 tons, with an estimated area under cultivation of the order of 80,000 hectares. (UNODC at http://www.unodc.org/unodc/index.html ).An even larger bumper harvest is predicted for 2004. “the battle against narcotics cultivation has been fought and won in other countries and it [is] possible to do so here [in Afghanistan], with strong, democratic governance, international assistance and improved security and integrity.” ( Statement of the UNODC Representative in Afghanistan at the :February 2004 International Counter Narcotics Conference, http://www.unodc.org/pdf/afg/afg_intl_counter_narcotics_conf_2004.pdf , p. 5). Consistent with these UNODC estimates, the average price for fresh opium was $350 a kg. (2002); the 2002 production was 3400 tons. (http://www.poppies.org/news/104267739031389.shtml ). This information is too horrible to even make comments on.